(W) Tom Taylor (A) Marcio Takara, Ig Guara (CA) Bengal. Laura Kinneys greatest battle so far has been fought, and won but at what cost? As she and Gabby attempt to move on with their lives, her predecessors legacy continues to cast a long shadow. Laura is the Wolverine, but is she ready to meet this realitys new arrival, Old Man Logan? Hes stepped out of a dystopian future into our world and hes about to bring a lot of carnage Lauras way. But when a new CIVIL WAR divides the Marvel Universe, will these past and present Wolverines stand together? Or will they shred each other apart? And when the superhuman conflict puts those dearest to her in harms way, can Laura remain the hero shes fought so hard to become or will she finally succumb to her dark destiny? 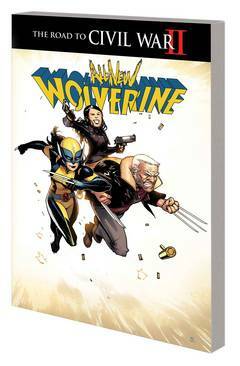 Collecting ALL-NEW WOLVERINE #7-12. Parental Advisory.